Get your website backlinked on top of Quora questions. Quora, it's not just the place where people look for reliable information about your industry, but it is now being loved by Google. Whatever your niche is, chances are you find one or two Quora questions showing up on the front of page Google search results. And it does send thousands of highly targeted traffic to your website. Take "Best YouTube Downloader" or "Best digital marketing course" or "Best online earning course" as an example. If you search on Google for these 2 most competitive keywords, you will then notice that Quora is showing up on the front page of search results. You will not just get a power signal, but literally thousands of traffic will be driven to your website. And here I am doing exactly the same thing. I am an expert Quoran, having a couple of heavy-weight accounts. And I can get it approved by Quora Moderators and put your website link on top of Quora thread. So the next time people come to that question through Google search result, they will always see your website being recommended in an engaging way. So most of them will show interest to visit your site to checkout about your services. 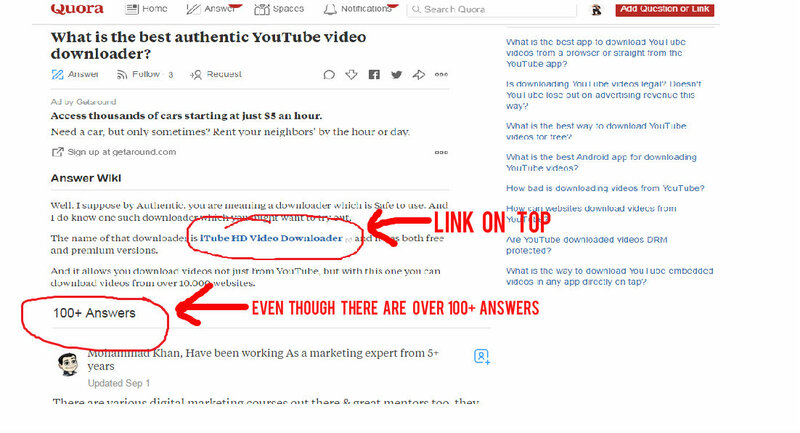 * Add 2 links on top of 2 different Quora questions only for $5. * Unlike other sellers, I will not just add a link and suggest you expect for a tons of traffic. NO. I will write a short and highly engaging content as well so people feel encouraged to click on that link and checkout your site. So it's obvious that most people that will see that link will end up becoming your traffic. * And I will give you a solid guarantee that those Links will stay forever and continuously drive traffic to your site. And if the get broken within 1 year, I will then fix them ASAP. * Finally, I give you a full Refund guarantee. If my service doesn't satisfy you, I will then refund you right away. So try out my service with 100% confidence. The links will go through a check by Quora Moderators. And it usually takes 4 to 5 days to get approved. But I will do my best to get it approved as soon as possible. # Step 2 : I will then search for questions which are..
# Step 3 : And I will then add Links and deliver the order. So try it out today. You will get maximum exposures, eye-balls, and of course, a permanent source for high quality traffic. Add top backlinks on Quora qestions is ranked 5 out of 5. Based on 3 user reviews.